It's nearly time for the #TommyvCancer month long blog tour we are doing to help raise awareness and bring in donations for Tommy Donbavand as he battles with cancer. We have some exciting news to share with you about the #tommyvcancer blog tour today, but first can we all take a moment to appreciate the organisational skills of Faye Rogers, who has created this gorgeous look blog tour banner and sent out media kits to all the blog tour participants. So onto the first bit of our exciting news! There will be a Twitter Chat celebration to finish the #TommyVCancer blog tour off. 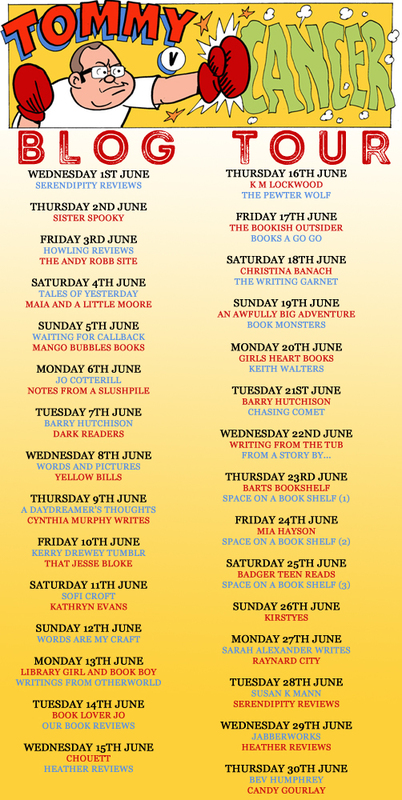 We are going to host a live Twitter chat on the 30th of June (the last day of the blog tour) from 8pm until 9pm. The chat will be hosted by Michelle Toy and myself. We will be asking questions about Tommy's books and the blog tour. We would love you all to take part. The official hashtag for the chat will be #TommyVCancer. The second part of our news is all about the giveaways, organised by Laura a.k.a Sister Spooky. We have FOUR HUGE GIVEAWAYS to go with the blog tour. Laura has amalgamated all the prizes offered by the UK children's publishing industry to give you some amazing competitions to enter. The following people will be hosting giveaways on the days listed. Pack 1 hosted by Laura Heath/SisterSpooky on June 2nd. Pack 2 hosted by Faye Rogers/Daydreamer's Thoughts on June 9th. Pack 3 hosted by Andrew /PewterWolf on June 16th. Pack 4 hosted by Chelley Toy and myself on Twitter on June 30th. To enter each prize draw, you will be asked to donate £1 (or more) to Tommy's Paypal fund and then you will also have access to extra free entries. The idea is that we help Tommy and his family, a little, as he continues to kick cancer's backside. The winners will be announced during the twitter chat on the 30th June. To claim your prize you MUST keep your paypal receipt. You'll be asked to give proof of your donation along with your UK postal address in order to claim your prize. Prizes will be sent out by the publishers/agencies so delivery times may vary. This is going to be a mega tour with lots of opportunities to take part. Please join us and help us help Tommy Donbavand!